Organizations should be used by anyone who needs to be able to appoint a person or persons to manage smaller groups of individuals within the iLearnPro application. We call those smaller groups organizations. Each organization can be appointed one or more Organization Managers, who will have access to the organization details and the ability to manage users and access reports within their organization. To use organizations, an Account Administrator has to toggle the use of Organizations in their settings. This is located under the Account Section at the bottom in the subsection called Configuration. NOTE: If the term "Organizations" doesn't appeal to you, you can re-name the feature so it appears as a different title throughout the application- such as "Departments" for internal use or "Businesses" for resale purposes. Click on the Organizations icon in the Navigation Menu to begin. 2. Enter a Title for the organization. 3. Enter a Description for the organization. 4. Enter the Organization Manager’s email to send a notification for account setup. 5. Add a Registration Code for organization members to automatically register as a part of this organization. 6. If this group has access for a limited time, add an Expiration Date. 7. Leave the Disabled box unchecked to use this organization. This organization will now be available for registration and report filters. 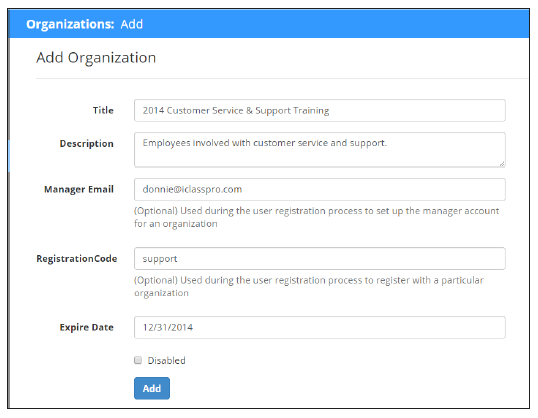 Only one organization manager can be set up using the settings on the Organization page. However, more than one organization manager can be set manually by simply going to the Students area of the Navigation Menu, editing the user you wish to grant organization manager permissions to, then choosing the Organization Manager role and the Organization that user belongs to. After you save these changes, the next time the user logs in, they will see the new Organization Manager navigation options!